Brandon: In Parts 1 and 2 I have stated how I my interest in D&D was piqued. But now I can hear you asking, "Have you actually played yet, Brandon?" Yes, yes I have. It started with some very short and extremely homebrew games with my two children DMing (being the Dungeon Masters). If I remember correctly our oldest was about 8 or 9 at the time. That's how old our youngest is right now and they have started to DM more. But, I'm getting ahead of myself. We did some homebrew games at home as a family and then Tarehna created a birthday adventure for a friend of ours. This was all very fun, but I still didn't feel like I was getting the full D&D experience. A lot of it was that I didn't know enough about character creation and role playing or the game itself. All of that changed when we got the D&D Starter Set The Lost Mine of Phandelver. 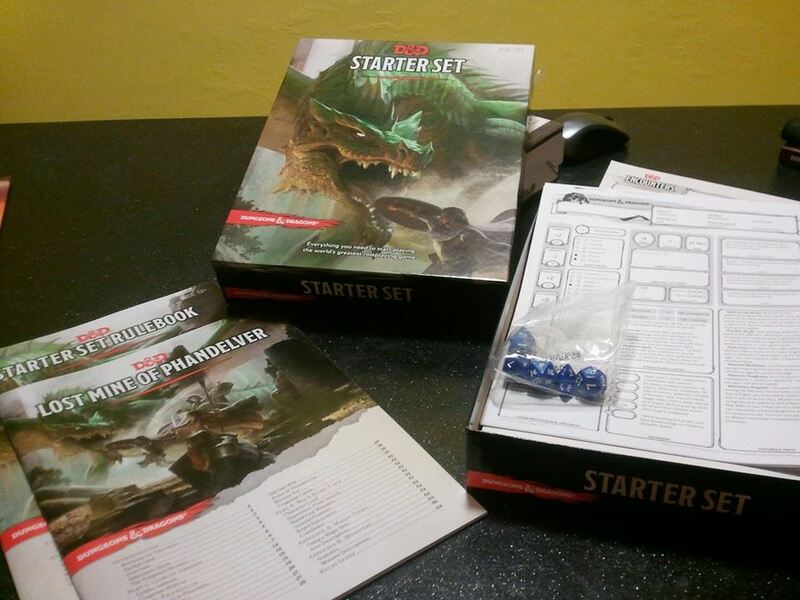 The Starter Set comes with dice, an adventure, a small rules book, and pre-made character sheets. We opted for the pre-made characters to get the whole flavor of the starter set, though you can create your own. The plan was for our family to play once a week with Tarehna being the DM. That plan didn't quite work out. It took us about a year to finish the adventure The Lost Mine of Phandelver. I'm confident you could finish it in a day or two if you didn't play it about once a month for 30-40 minutes at a go. 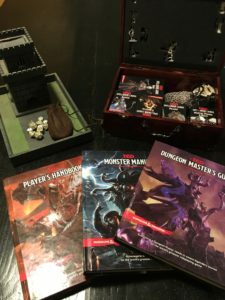 What do we love about D&D? There is so much! First, character creation, once one gets the hang of it, is a lot of fun. There is a lot of referencing and cross referencing. You get to choose if you want to be a human, or half-orc, or a tiefling, or a tabaxi. Do you know what a tiefling is? And then you can be a wizard, ranger, or bard. "Bard?" you ask. "Bard." I respond. Trust me. That's just the start. You can have spells, and special gear, and wondrous attributes. And wait until you level up and you get more spells or more special attributes. You want to know the best part? The storytelling and the team work that can evolve as your characters learn how to interact is so fulfilling. You get an incredible feeling of accomplishment when you over come challenges together. I have stood up in anticipation and anxiety waiting for another player's dice to stop rolling to see if they succeeded or failed. We have cheered each others' achievements and also felt regret at lying to characters we have met in game in order to serve our own needs. It's important to have fun the way you want to. Focus on mechanics if you want. Maybe you will choose to be more lax about some mechanics so you can focus on storytelling. You can be focused on both and attempt to make the game as immersive as you want. I haven't even mentioned all of the stuff you can acquire if you are so inclined. There are miniatures and maps, dice, dice towers, dice trays, spell cards, and pewter mugs. Well, you don't need the pewter mugs, but they do add to the ambiance. I'm looking at all the text above and realizing I could easily turn this into a 4 part series. I'm also realizing that may have to wait. For now I will state that if you haven't played Dungeons & Dragons and are interested you should try it. Jump in! Get the Starter Set and some friends and learn together. You may already know someone who knows how to play who can guide you. There are also many online resources to get you headed in the right direction. You can even play with other people online. Check Facebook groups and Reddit forums. One bit of advice before you do get started: Find the right group of people for you. Find a group that allows you to role play as much or as little as you want. Find a group that is supportive and one the same page as far as what you all want to get out of the experience. Now, in lieu of a Part 4 I am going to recommend some other role playing games that you should take a look at. Not everyone wants to fight dragons while pretending to be a sorcerer Kenku. What? You don't want to have to be violent in your RPG? No problem. Take a look at Golden Sky Stories. In this game you are all semi-magical animals who occasionally take on human form to help each other and become friends. Golden Sky Stories can be cute, heart warming, and fun.